tags: To stop a weapon that has no cure...you need a man who knows no limits. Day 3: 3 years after the 2nd season, Jack Bauer is still working at CTU along with his daughter, Kim, and her boyfriend, Chase. Things begin to heat up as a drug cartel threatens to release a virus if their leader is not released. President Palmer is running for re-election and has to deal with a smear campaign launched by his opponent, and a traitor is operating in CTU. In this concept drama, each season takes place within one 24 hour period. Day 1: Jack Bauer is the head of field ops for an elite team of CTU agents who uncover an assassination plot targeting Presidential nominee David Palmer. Meanwhile, Jack's strained marriage to his wife, Teri, is pushed to the brink by the sudden disappearance of their troubled teenage daughter. What will the next 24 hours hold? This is the masterpiece of all-time !!! 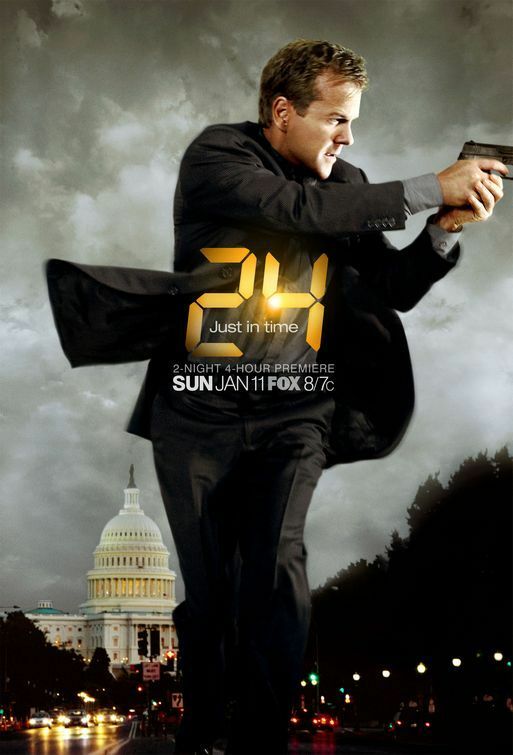 When I first started to watch "24" I thought that this is the next film about agents, police, FBI etc. But when I was watching 3rd or 4th episode I realized that I can not stop. Now I am in 3 season and I find this movie the most excellent film ever. Everything is just like it should be, nearly no mistakes, and the action is overwhelming. I would just say to anybody who missed this one to sit down and see this Masterpiece asap. Firstly may I begin by saying - Beatnick, if you're going to trash a show try and write a review that contains at least a shred of credibility. You used the word childish a few times in your review, that sums you up perfectly. Learn to spell before you try and write reviews on the best movie database in the world eh? Anyway, back to 24. OK, as some have touched on it you do have to suspend some belief but I can't remember any film or TV show where that wasn't applied anyway. The majority of the silly stuff does indeed revolve around the incredibly dimwitted and frankly annoying Kim Bauer but thankfully she's not in season 2 that much and her storylines are largely irrelevant. Some eye candy for the boys seems to justify her existence in this series, but I could have done without her. The rest however is tight as a drum and if you're willing to let yourself be entertained then this will do the trick. 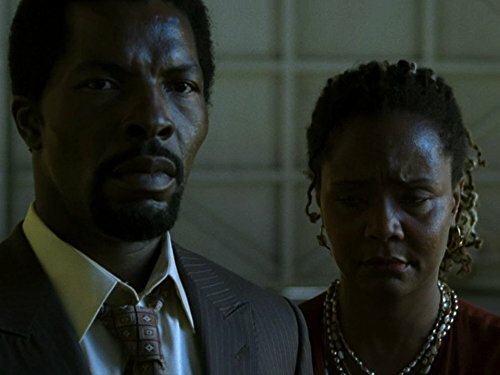 Some fine performances and tasty direction make this a damn good show to watch. I actually prefer season 2 to season one as the subplots involving Palmer's family in season one were simply annoying and got right on my nerves. In season 2 every scene involving Palmer is dynamite and that's why season 2 gets the nod for me. Overall fantastic stuff, much much better on DVD with the continuity it brings. For 50 quid I got both season's and that was a steal. Solid entertainment and along with the mighty Band Of Brothers the best TV boxset out there. Enjoy. Niz For the most part the attacks have been personal vendettas(day 1, day 3, day 5, day 6) against Jack. So ergo where there's Jack, there is a terrorist attack. Los Angeles is a large populated city with airforce and military bases, major airport, and other international resources in and around the area, along with ideal "deserted" locations. According to the show, there are other CTU offices located around the United States, so we may never know what other threats there have been. And it's overall a better location production-wise. They have also been some attempted real life terrorist attacks planned for Los Angeles. Two examples would be the December 1999 attempted bombing of LAX and the plan to hijack an airliner and crash it into the Library Tower, as revealed in 2006. After sailing off at the end of season two, Max seemed to have disappeared. The truth is Max was "taken care of" in 24: the Game, which took place roughly 18 months between season 2 and season 3. In the Game, Max's plot included releasing Ricin into the LA Harbor, an assassination attempt on Acting President Jim Prescott, a phony Sarin gas attack on the subway, kidnapping Kate Warner and Governor James Radford before ultimately conscripting and assassinating the latter, an attack on a U.S. Military base, and smuggling weapons out of the country with the coerced help of Bob Warner. The Game also followed up on how Chase and Chloe came to work at CTU, as well as delved deeply into Jack's relationship with Kate Warner. The Game also featured a secondary villain from Jack's pre-CTU past named Peter Madsen who targets CTU with an EMP in order to release a prisoner and obtain an important hard drive, kidnaps Kim, and coerces Jack into stealing confidential data from a CIA building. Alexander Trepkos' wherabouts are unknown at this time. In episode 3.1 Wayne Palmer reveals it was David Palmer who, in a weakened state, authorized a manhunt for the masterminds behind Day 2's events and arrested the one in charge, meaning that since Max and Peter Kingsley were both killed, and since Trepkos appeared to work beneath Max but above Kingsley, that Trepkos was likely the one arrested. Wayne Palmer suffered an attempt on his life while in office as the President of the USA (Day 6). Although kept in medically induced coma due to his critical condition, he was vital enough to be be resussitated, in order to prevent vice-president Noah Daniels from assuming office and starting a nuclear war. However, he kept needing repeated shots of adrenaline to stay conscious, which finally caused him to collapse and slip into coma due to brain hemorrhage. His doctors mentioned that he would not be regaining consciousness any time soon and he was not seen anymore for the rest of the series. His fate was finally revealed in 24: Redemption, although not directly; an on-screen newspaper article on the departing President Noah Daniels makes mention of Daniels' "deceased predecessor", indicating that Wayne finally succumbed to his injuries somewhere during or after Day 6. Wayne's ultimate fate was kept ambiguous on the show due to the policy of Fox Network of not killing-off active Presidents on-screen (President John Keeler in (Day 4) survived the attack on Air Force One for the same reason) . The Special Agent In Charge aka Director of Operations is the person that runs a CTU Field Office. They work primarily inside the building, but is ultimately in charge of all operations and agents. The Special Agent In Charge is the highest-ranking agent in a domestic unit, but is out ranked by agents from Division and District Command. The Chief of Staff is the second-in-command of a Domestic unit.The Chief of Staff is in charge of all Communications and Logistics personnel in the building. If something should happen to the Special Agent In Charge, then the Chief takes over the Special Agent In Charge's responsibilities. The Director of Field Operations is the person in charge of all tactical teams at a particular CTU Domestic Unit. The position is below Special Agent in Charge and either equal to or lower than Chief of Staff. Field offices report to Division which is run by a Divisional Director. Division carries a larger amount of jurisdiction than field offices. Division reports to District Headquarters which is run by a District Director and handles command over an entire region of CTU field offices. However in season one, it is stated the reverse is true and District reports to Division, so either there must have some restructuring in command between season one and two or it could have been human error failing to correctly remember the complicated command structure. And finally CTU reports in general to the National Security Council, which the Secretary of Defense is a part of, explaining how Heller had authority over CTU on Day 4. It should also be noted that the Director of Field Ops position did not exist until season three, so further restructuring must have been done to lessen the responsibilities of the Special Agent in Charge. Originally in season one the chain of command in the Field Offices went Director/SAC, Second in Command, and Third in Command with an Administrative Director overriding all three. In season two, the Administrative Director position appears to have been eliminated with those responsibilities given to the SAC. Before season three CTU must have further clarified the responsibilities of the Second and Third in Commands thus creating the Chief of Staff and Director of Field Ops positions. In the script and during most of the rehearsals the line went: "I will hunt you down for the rest of your life."